Our WordPress eCommerce Shop Theme has recently undergone a massive update. We have rebuilt the theme from the ground up, using our new Seed Theme framework. Selling physical and digital products online is a breeze using our Shop Theme and the WooCommerce plugin. The latest Shop Theme features lots of new goodies like an improved responsive framework, retina optimized design, font icons, shortcodes, post formats and much more. It features a new design that is minimal and modern, easily adapting to any brand! The latest version is developed to work primarily with the powerful WooCommerce plugin. The theme is capable of displaying posts or products within the featured slideshow, and has a wide range of theme options for changing colors, layout, social media and more. Whether you’re selling shirts, images, software or jewelry — the Shop Theme is the perfect choice for your eCommerce website. For an entire website solution, don’t forget to try our Auto Install form to purchase the Shop Theme with 3 months FREE hosting using the promo code “INSTACOOL”. Learn more here. It looks outstanding. What a master piece. Awesome theme it’s good for eCommerce site. But I’m interested to know whether it compatible with car66 or not? 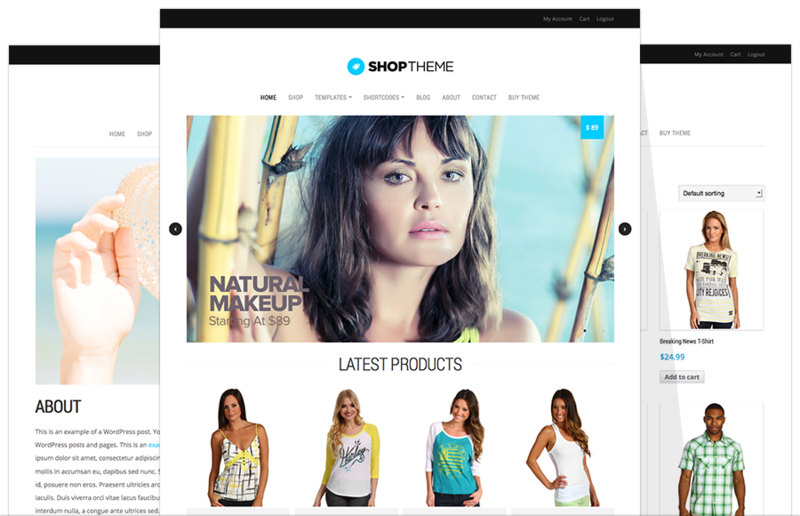 The theme is built for use with WooCommerce. This theme is not working and saying its a virus on all browsers! Theme looks good and clean. And woocommerce is great choice. bought this but now don’t see an option to add products. Thoughts? Do you have the WooCommerce plugin installed and activated? im using this theme but i unbale check out. y? If you’re having difficulty purchasing a theme, then please send an e-mail to [email protected] and we can look into why.